Historically, Juventus is Italy’s most successful football club, winning the Italian Serie A 27 times (excluding the 2 titles stripped in 2005 and 2006). In total, they have won 51 official competitions since 1929. In May 2006 Juve was one of five clubs linked to a match-fixing scandal and as a result, was relegated to Serie B for the first time in history. Its stock fell from a high of €2,25 in 2006 to a current price of around €0,81. The Calciopoli scandal also had a drastic effect on the club’s financials and in 2007 the club raised €105m by issuing 81m new shares in a two-for-every three-owned offering (€1,29 p.s.). Juventus has been a joint stock company since 1967 and has been listed on the Borsa Italiana since December 2001. The float is 32.5% of total shares and 60% is held by the Agnelli family. Juventus aims at being a leading European sports organization in terms of operating professionalism. As said before, the relegation to the Serie B obviously had huge financial impacts on the club. It was forced to sell many of its best players as revenues fell drastically. The controlling Exor group (of the Agnelli family) reacted to the relegation by sacking the management and recruiting Jean-Claude Blanc as CEO (who has built up experience at the Winter Olympics, Tour de France and the French Tennis Fed). Although Blanc has been criticized for lack of football experience and a high paycheck, we would argue that he managed Juve’s financials with Zidane-ish skill. In the years leading up to the Calciopoli scandal, Juve had good operating results, €44,2m in 2005 and €13.4 in 2006, but invested heavily in players. Net loss was €3 m in 2005 and a whopping €46m in 2006. So, Blanc took over in 2007 and although revenue fell from €214 m to €141,5m in 2007, the club managed to break-even at the operating level. Player trading delivered a gain of €18,8 m which offset the impairment of fixed assets. The club returned to the top division in 2008 and made some heavy investments on players costing them a net amount of €15.1 m, resulting in a net loss of €20.8 m in that year. Combined results for 2009 and 2010 ended in break-even. After the 2006 season and the match-fixing scandal, the legendary Luigiano Moggi got banned for 5 years and his assistant Alexandro Secco took over as Sporting Director. After the relegation, Fabio Capello left as coach and Didier Deschamps took over. As said before, Juve got promoted but Deschamps mysteriously resigned (a dispute with Secco being rumoured as the main reason). Claudio Ranieri took over and got Juve 3rd place in 2008 and 2nd in 2009. This was thought to be unacceptable and Secco fired Ranieri and promoted the totally inexperienced Ciro Ferrara. The 2010 season was a disaster as Juve fell out of the Championship league, fired Ferrara and hired Alberto Zaccheroni. The club ended the season in 7th place. Secco also made many blunders on the transfer market paying top dollars (and top wages) for players such as Amauri, Diego, Melo, Grosso, Thiago (and the list goes on). After last season, Exor chairman John Elkann brought in his cousin Andrea Agnelli as chairman, who in turn signed on Bebe Marotta as Sporting Director, who in turn signed Luigi Del Neri as coach. Mr Marotta is well known in Italian football for exceptional prudence in regards to player trading. The registration rights (RR) of contracted players at football clubs is registered on the balance sheet as intangible assets which is to be amortized during the life of the contract according to IFRS. However, the assets on the balance sheet do not necessarily record the real economic value of the RR portfolio. If a player is brought in on a free transfer, promoted from the youth system or renews his contract, the value escapes the balance sheet. For instance, although we’re not sure what method they use, transfermarkt.de estimates the first team value of European football clubs. According to the website, Juventus’ squad is valued at above 200 m (by subtracting the value of players on loan and adding the value of players out on loan). These numbers are highly debatable as they are more than twice the amount of the €99,7m in RR on the balance sheet in Juve latest financial report. The true value of Juve’s RR is important as it is almost twice the amount of shareholders equity. “Of course, Juventus have been limited by the capacity of their ground, which is very low at 28,000, only underlining the importance of moving away from the Stadio Olimpico. To that end, they have begun construction of a new 41,000 capacity stadium on the site where the hated Stadio Delle Alpi once stood. Juventus will be the only Italian football club to own its own stadium, which is scheduled for completion in July 2011, though many others are keen to emulate them. This development will give them a better chance of competing financially with Europe’s other great clubs. The stadium was originally estimated to cost €105 million, but this has recently been increased to €120 million to cover some design improvements. However, this should not diminish the club’s ability to buy new players, as they have put into place three pillars to finance the construction: (a) Sportfive has acquired the naming rights for €75 million (€6.25 million for 12 years, though a significant proportion will be paid in advance during the building phase), which it will assign to a multinational; (b) the €20 million sale of commercial land adjacent to the stadium to Nordiconad, who will also pay the Turin council €9 million for infrastructure improvements; (c) a 12-year loan from Istituto per il Credito Sportivo for €60 million (originally €50 million, but an additional €10 million added in May). 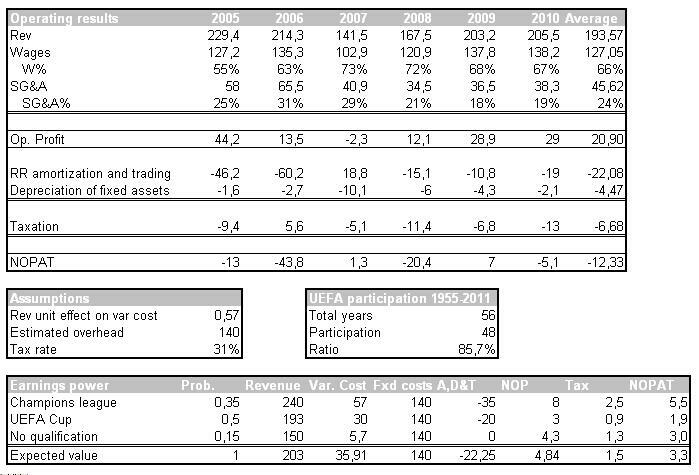 In order to figure out the earnings power of Juventus, we borrowed the six-year summary of operating results from the Juve article on the Swiss Ramble and reformulated it to find NOPAT. In the last 56 years, Juventus has been a participant in a European competition 48 times. So, in estimating ‘normal earnings,’ we assume an 85% probability of qualifying for a European competition. From the regression results, it can be predicted that with an increase in revenue (above €140 m) of 1 m cost increases by €0.57 m with a relatively good probability. The most uncertain part of the analysis is estimating the impact of the new stadium. In the 2009/2010 season, about 8% of revenue (€14 m) came from match day revenue. Although management has indicated that it estimates the impact on revenue to be €40 m, I have not been able to find any cost estimates. In our model, we assumed that the additional variable unit cost of the augmented revenue from the new stadium would be 1/4th of current unit costs. As shown below the results of the valuation model was a price per share of €2.31, with 85% of the value coming from the new stadium. Although this would indicate a margin of safety of 59%, the large share of implied value coming from the new stadium is a big uncertainty. Juve reported a very negative first half of the 2011 book year, posting a loss of €37.7 m. Compared to revenues of €125 m and €85.7 m in operating cost in the first half of last year, revenue came in at €88.8 m and costs were a staggering €100 m.
If we look at last year, operating margins were higher during the first half, so the losses are not likely to correct in the second half. Judging by this fact, I would estimate a total loss around €60 m for the year. Were that to occur, 60% of shareholders equity would be wiped out of the balance sheet in one year. In addition to that, it is almost certain that Juve will have to invest in the new players (or buy players’ contracts that are currently on loan) for next season. With the club already in a negative cash position, the funding of new acquisitions is a concern. I would, therefore, regard it as highly probable that the club will need to raise additional equity. Shareholders equity currently stands at €51 m with about 201.5 m shares outstanding. A conservative estimate of a €20 m loss for the second half of the year would bring shareholders equity down to €30 m.
Let’s say that the club decides to raise funds by issuing new shares. The share offering would have to be at a discount to market price, let’s say €70 cents. Now, let’s assume that the club requires funding of €100 m. This would mean that 143 m new shares would have to be issued. The dilution of share value would bring intrinsic value per share down to €1.34. The current price of Juve shares is about €0.81 indicating a margin of safety of about 40%. But that is without factoring in the risks concerning the new stadium and the uncertainty of future revenue and profitability because of that. I am bullish over the long-term prospects of Juve, but my analysis leads me to think current risk-reward weighing is unattractive. I have therefore disposed of my position in the company but will be following the company closely in the future. I have no idea, but I´ll try to figure it out. Thanks for the comment. I have no idea, but I´ll try to find out. Thanks for the comment. The capital increase came in at €0,148 per share.